Consider this (the attached picture) as a fast fact sheet with some basics and hints. I made it for a student who just started. There are no manufactured sets of chords like characters on a typewriter which you can use to write or play music. Music is not about learning some chords you can pick from a book. Music is about understanding music. Even tabs are rather worthless if you don't have a clue. A chord is made of notes with certain intervals. From the lowest to the highest and all intervals in between, and -also very important- relative intervals. C-G is not one interval but it's actually two! Both 5th and 4th, derived and absolute. Forget that, first of all it is about notes on certain positions in a scale. It is up to you which notes you choose and where and when, although of course there are quite some grips producing great sounds. Some of these grips are just needed for that one song you try to cover. However, don't be a robot. You may twist chords and alter notes while playing, still being consistent. Do not be a robot. No need to if you understand music. If you are a beginner: first get used to the major scales. The intervals. 1-2-3 4-5-6-7. Like 'do-re-mi'. Then try to understand how chords are built, how they get their names. The sheet will give you some hints. Most important: understand that chord notation uses a convenient frame which is consistent within music theory. It's nothing more and nothing less. A convenient structure. Again, there are no prefab chords. Music is about feeling and understanding music. Also: learn the circle of 5ths. This will make things much easier. 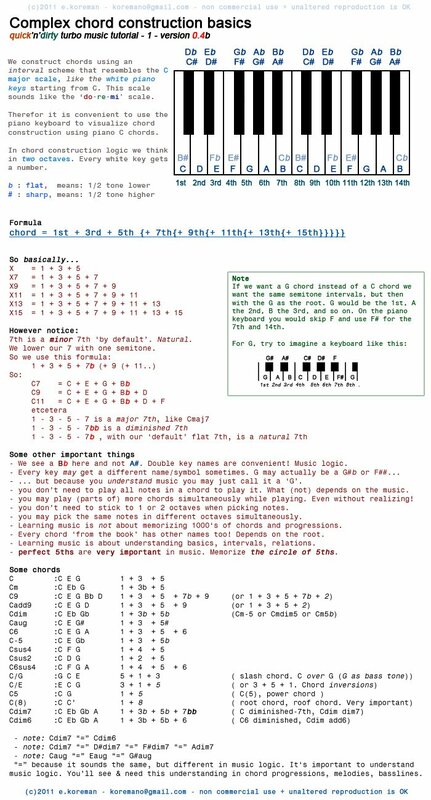 Understand that the frequency of a 5th is 1.5 times the root note. The root note one octave higher is 2 times the frequency of the root note. Also, the root note is 1.5 times the frequency of the 4th below the root note, so it is 0.75 the frequency of the 5th. All notes are related that way, frequencies are multiplied and divided by/in constants. The more factors you have the more dissonant. The less the more harmonic. Additional notes may make harmonics more or less strong. Or more complicated. This is what you hear when you hear music and this is what gives flavor to chords. This is why out-of-tune sounds horrible: it does not match in any way. The circle of 5ths basically shows the most important relations and offers logic in forests of i.e. chord progressions. C G D A E B F# C# G# D# A# F C is a nice start to memorize.